Use mouse to select the correct mine to pass the tank. For example if it asks to pass from the number which rounds to 30 the answer would be anything which is greater than 25 and less than 35. In other words the answer would be the number which when round give 30. 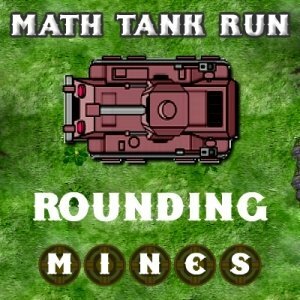 Math Tank Run - Rounding is a math based defense game where you need to save your tank from deadly mines. Click or tap the tank to speed it up or slow it down. Click or tap to the right or left of the tank to shift it right or left. Use the hint before each mine field to figure out which mine is a dud. Don’t allow the tank to touch active mines. Collect Gold coins to earn more bonus points. Bei WasZumSpielen.de findest du viele tolle Abenteuer Spiele. die du kostenlos spielen kannst. Math Tank Run Rounding ist ein klassisches online Abenteuer Spiele das du direkt in deinem Browser ohne Anmeldung spiele kannst. Hat dir das Spiel Math Tank Run Rounding gefallen? Dann schreibe ein Kommentar was dir gefallen und gib deine Bewertung ab. So wissen auch andere ob es sich lohnt Math Tank Run Rounding zu spielen. Wir suchen für dich in der Zwischenzeit ähnlichen Games, damit du immer einen Nachschub an Abenteuer Spiele hast.